I then add into the mix tips and hints about the most effective ways of taking science to a family audience in a public space before getting the participants to think about how they might take their own research topic to a public audience and the challenges they might have to overcome. Camelot, the company that runs the National Lottery in the UK, uses the by-line Serving Nations’ Dreams but the reality is a little different. One disabled man spent his life savings £60,000 0n scratch cards over six months. What are the purchasers imagining as they scratch off the thin film that conceals their fate? Do they conjure up something that they have always wanted or just hope they will at least get their money back? For most players their card will be a loser. I became interested in whether how they felt at that moment was reflected in what they did with the card so I began collecting discarded cards in about a 100 yard radius of my local scratch card sales point, which happened to be a Londis Supermarket. I have over the last year picked up over 500 cards with a potential face value of over 100 million pounds. Some of these cards have been torn very systematically into fragments, some have been just been torn in half, others have been crumpled, but most are just discarded intact. I have come to see my collection as bundles of discarded dreams. I have now used some of the cards as part of the building materials for an imagined Camelot [renamed Looselot]. Torn up cards form an insurmountable curtain wall around a golden castle. Outside these walls is a shanty town of make shift shelters. Is the National Lottery a stealth tax? OVERALL ODDS OF WINNING ARE APPROXIMATELY I IN 4 . Should the poorest people in the UK be subsidising the leisure activities of the richest through the National Heritage Fund? Is it ethical for the State to draw people into a potentially addictive and expensive activity? Looselot also featured this year at the Edinburgh Festival in a show called the Castle Builders. 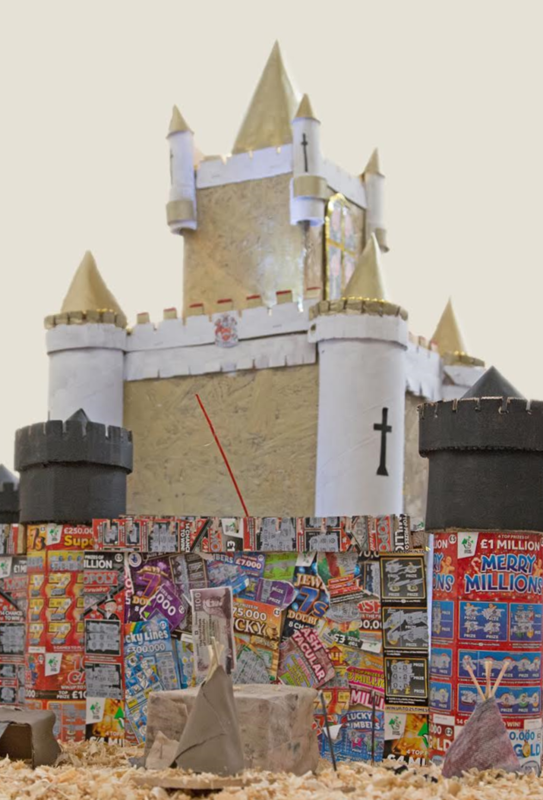 I am now in the process of developing other pieces made from discarded scratchcards, including models of luxury items which people crave, like sports cars, speed boats and trips to Disneyland. Its always great to perform at this Festival. I increase the average age of the contributors substantially just by taking part. Many of them entered science communication through Famelab, a talent contest that challenges scientists to take some aspect of science to a public audience in under three minutes which I played a part in launching back in 2005. Had a reason to trawl back through my Archives and came across some articles written before the www took hold and published in The Biochemist which I edited from 1992 to 2001. I thought some of them might make you smile in the most depressing season of the year. Everything he talked about was either in press or being prepared for submission to THE journal; tended to be coy about these pieces of information. Presentation was a full performance often including a few joke slides or puns. Dress: lounge suit. Manner: that of headmaster addressing morning assembly. Often worked in a clinical area. Presentational style adapted from that used to brief bomber pilots during the War. Always referred to colleagues by their correct titles and tended to convey the impression that he was not in the least surprised that his data failed to agree with that of his overseas colleagues. Treated with great deference by the Chair, answered questions crisply, and from a great height. Dress : Tidy. Manner: deferential. Read in a monologue from a script. Tendency to mutter “Next slide please”, even though they were holding the remote control. Avoided eye contact with the audience at all costs. Paused from time to time to wave the laser pointer at slides that would have taken Einstein a quarter of an hour to understand whilst mumbling things like”as is obvious from the seven columns on the extreme right” Audience too dazed and baffled to ask questions. Dress: Ideal for Hiking. Beard of nature reserve proportions. Eyes of great intensity. Worked in a well equipped shed. Audio-visuals various including unexpected single words on the blackboard and wordy slides interspersed with multi-coloured, animation packed moments when he reached the bit that had attracted commercial sponsors. Tended to respond to questions after a long pause, often answered an entirely different one. Dress: Jeans and button down shirt. Manner, someone who was a good deal older than they looked. Subject invariably Molecular Biology. Presentation appeared to consist of a random recitation of acronyms laced with the odd pronoun and a very rare verb which had been a noun in an earlier and less confusing incarnation. Some phrases seemed to have been deliberately invented because they combined a pun with a particularly bizarre image. The award winner talked casually about “Walking off the end of a YAC” Questions tended to be even less comprehensible since they came from the only other person on the planet who knew what the talk had been about. Fortunately, I can work with young kids in the guise of them teaching me Italian whilst I brush up their English. Italian primary schools have next to no science in the curriculum so you get a big welcome if you can fill in a little of that gap. Recently featured in the Sofia Science Festival with Meet your Brain an event I developed for the Arts Festival of my home town Canterbury. The venue was a 300 capacity tent in one of central Sofia’s very beautiful parks and the show stoppers were jelly brains. The next morning I took one of the brains, the lemon and yoghurt flavoured one, along to a chat show on Bulgarian TV’s Channel 1 and used it to take the viewers on a guided tour of the brain, and persuaded the host to amongst other things eat the Cerebellum. One of my weirder TV appearances. Right up there with winning the Loudest Voice in Britain competition on the BBC thirty years ago.